Lumix is Panasonic’s brand of digital cameras, ranging from pocket point-and-shoot models to digital SLRs. Compact digital camera DMC-LC5 and DMC-F7were the first products of the Lumix series released in 2001. They are equipped with Leica lenses. And in 2009, Panasonic introduced AVCHD Lite and AVCHD to selected members of its Lumix line of digital cameras. AVCHD Lite identifies a subset of AVCHD format, in which progressive-scan video is acquired at 30 frames/s with 720-line resolution. Such a video is recorded in the AVCHD 720p 60 stream by using a flag telling a decoder to play each frame twice. Announced in January 2009, the Panasonic DMC-ZS3/DMC-FT1/DMC-TZ7 digital cameras were the first digital cameras to offer AVCHD-lite movie mode. Since then, Panasonic has added AVCHD-lite to more of its digital cameras, such as the Lumix GF1 Micro Four Thirds, Panasonic Lumix DMC-G2, Lumix DMC-FZ35/38, Lumix DMC-TZ10/ZS7, Panasonic Lumix DMC-FX75, Panasonic LX5, LEICA D-LUX 5, LEICA V-LUX 2. Mac Editing software on Mac like iMovie 8/9/11, Final Cut Pro 6/7, FCP X, Avid, Adobe Premiere Pro, Kdenlive, After Effects, Adobe CS4 Master Collection, Adobe Encore, etc can’t perfectly import AVCHD/AVCHD Lite .mts files from Panasonic Lumix Series directly but it can import the folder of AVCHD/AVCHD Lite files if they are in the correct structure. If you just want to import .mts files to FCP/FCE/iMovie/Avid/Adobe Premiere Pro, etc for editing, Mac Panasonic Lumix AVCHD/AVCHD Lite Converter is a recommended software. With intuitive interface, you can easily and fast convert panasonic lumix AVCHD/AVCHD Lite files to MOV with H.264 codec using the professional lumix to MOV Converter. And Mac OS X 10.8 Mountain Lion,10.9 Mavericks,10.10 Yosemite is supported by this software, just try it! How to convert/edit Panasonic Lumix AVCHD/AVCHD Lite .mts files with Lumxi Video Converter for Mac? Step 1. Add Panasonic Lumix AVCHD/AVCHD Lite videos to Panasonic Lumix Video Converter for Mac. Connect your Panasonic Lumix DMC Camcorder to iMac/MacBook with USB 2.0 cable or use card reader to transfer the AVCHD/AVCHD Lite .mts files to Apple hard drive disk. 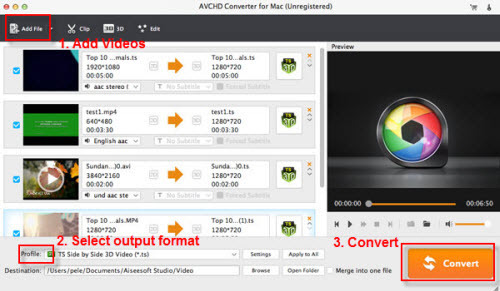 Run AVCHD Converter for Mac from UFUWare as the best Mac Panasonic AVCHD/AVCHD Lite to editing software Converter, and click the “Add Files” button to load .mxf videos. This Panasonic Lumix Video Convetrer can convert AVCHD/AVCHD Lite export lossless compression video/audio compatible with FCP/FCE/iMovie/Avid, etc on Mac. Click the “Profile” option, and move mouse cursor to General Video > MOV – QuickTime Video (*.mov) or HD Video > HD MOV Video (*.mov) as output format. To get 1080 videos, we need to click the “Settings” button and choose 1920*1080 as output video size. This is available in H.264 MOV and HD MOV format. Select the files in the filelist and click Merge, and the Mac Panasonic Lumxi Video Converter will join and combine the video clips into a single file as output. Step4. Convert Panasonic Lumix AVCHD/AVCHD Lite .mts to h.264 MOV for FCP/FCE/iMovie/Avid etc. Click the convert button under the preview window, the Mac Lumux Video converter starts converting Panasonic Lumix DMC videos to h.264 MOV, and joining the Lumix files for editing on Mac. After converting and merging the Panasonic Lumix MTS files, just import the output h.264 mov files to iMovie, FCE 4, Avid, Final Cut Pro, Adobe Premiere Pro, Kdenlive, After Effects, Adobe CS4 Master Collection, Adobe Encore, etc for editing.